So last weeks Time Out New York revealed the Essential Burgers of NY...and Im eating my way through the list. Doing good so far! This week we tried out Corner Bistro based on Anito Lo's, Rickshaw Dumplings, recommendation of a classic burger. She's dead on! 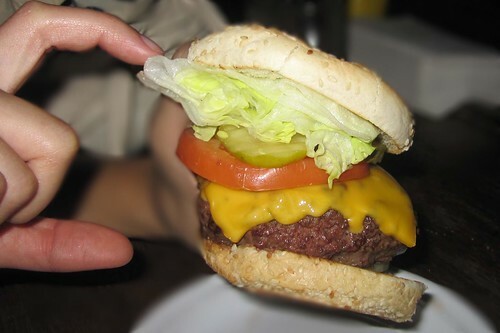 With all the ingredients stacked together the burger measured a good tall 5 inches! The thick plump patty was cooked medium rare and had blood dripping out-- seriously, it was a delicious basic burger. And cheap! I still prefer Shake Shack (UWS) as my #1 (and the special sauce), with Burger Joint coming in close behind. And I know I had the burger at the Spotted Pig-- but all I remember is their crispy pigs ear. Dumont was okay, but just okay. Didnt try the burger at Txikito, but I had other stuff and I think I may get a heart attack if I go back. All Im missing out on is Minetta Tavern-- which Ive been hearing may soon become my #1...yum yum yum.